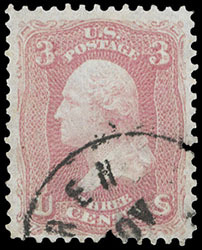 1861, 3¢ pink, neat town cancel, brilliant true pink color, well centered amid wide margins, Very Fine and choice, a lovely used 3¢ pink issue; with 2000 P.S.E. certificate. 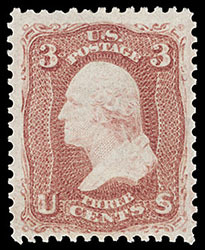 1861, 3¢ brown red, o.g., never hinged, rich color and remarkable freshness, Very Fine, very scarce in never hinged condition; with 2001 P.F. certificate. Scott No. 65 $125 for hinged. 1861, 3¢ rose, full strike of fancy shield in circle cancel of Alexandria, Va. exceptional centering amid wide margins, an Extremely Fine gem; with 1994 P.F. certificate. Skinner-Eno No. PS-FC 24. Scott No. 65 Estimate $150 - 200. 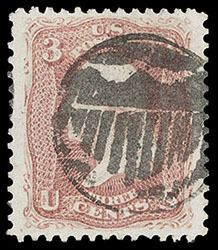 1861, 5¢ buff, light blue and red nearly face-free cancels, exceptional centering, rich bright color, Extremely Fine and choice, a striking sound stamp; with 2000 P.F. certificate. 1861, 10¢ dark green, o.g., never hinged, choice centering, incredibly rich and intensely deep color enhancing a detailed impression on bright fresh paper, Very Fine and choice; with 2018 P.S.E. certificate. Scott No. 68a $1,350 for hinged. 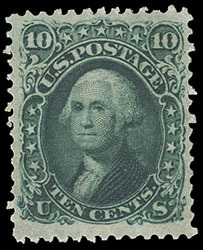 A UNIQUE NEVER HINGED EXAMPLE OF THE 1861 10¢ WASHINGTON ISSUE IN THE DARK GREEN SHADE - CERTAINLY ONE, IF NOT THE FINEST KNOWN NEVER HINGED EXAMPLES IN EXISTENCE. A search of the P.F. 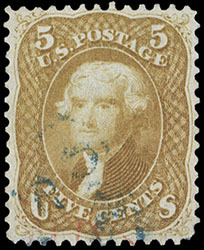 Foundation "Certificate Search" revealed only five never hinged examples of the 1861 10¢ issue in the typical green and yellow green shades. One single bearing a gum crease, another single reperforated at top and a sound strip of three with fine-very fine centering. The are no never hinged examples certified by the P.F. in the elusive dark green shade. 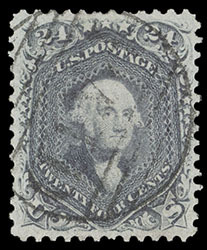 1861, 24¢ steel blue, large Boston "Paid" in grid cancel, beautifully centered amid well balanced margins, rich steel blue color, an Extremely Fine gem; with 2001 P.F. certificate. 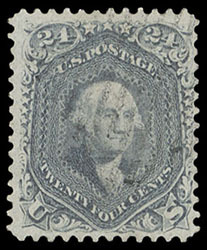 1861, 24¢ steel blue, rich distinctive color, nicely centered with light grid cancel, F.-V.F. ; with 1999 P.S.E. certificate. 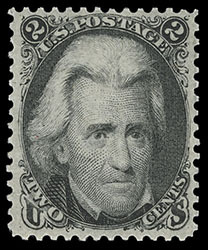 1863, 2¢ black, o.g., never hinged, choice centering amid nicely balanced margins, rich color and a crisp detailed impression, Extremely Fine, rarely encountered in never hinged condition; with photocopy of 2018 P.F. certificate for block and 2018 P.F. certificate. 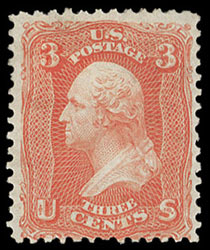 1861, 3¢ scarlet, part o.g., rich bright color, reperfed, Fine appearance, still a affordable example of this rare stamp.